On a recent sunny afternoon, Kubota Garden was busy with people who had come to photograph themselves against the backdrop of fall colors. Among those who were striking poses for the cameras, I saw a couple of teenagers donning softball jerseys, a joyful family made up of grandparents, parents and small children, and a young woman in traditional Hindu dress. The lure of this Japanese garden in Seattle’s Rainier Beach neighborhood is easy to understand. Not only is the scene of fall colors extraordinary, the 20-acre grounds provide multiple vantage points to please the eye. 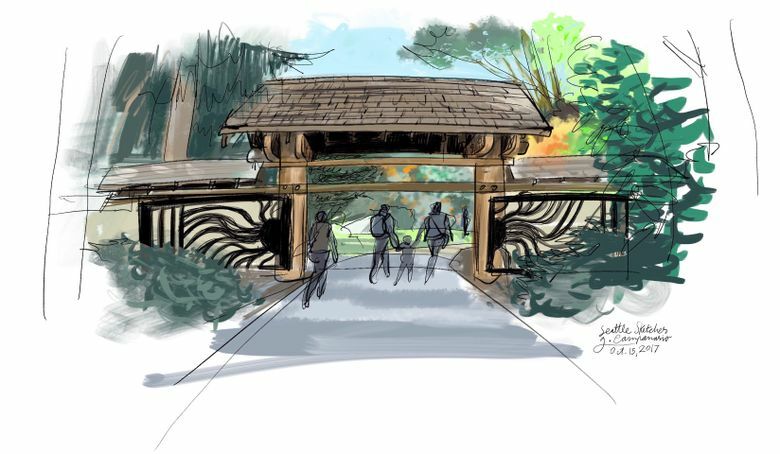 To add to the sketches I made here just a year ago, this time I focused on the artful sliding gate at the entrance, a true work of art by local sculptor Gerard Tsutakawa, the same artist who created that giant “Mitt” sculpture at Safeco Field. If you haven’t visited Kubota Garden yet, make sure to add it to your list. With or without fall colors to photograph or sketch, it’s a perfect spot to escape from the rush of everyday life.